2017 saw exciting technologies appear in entertainment for everyone. 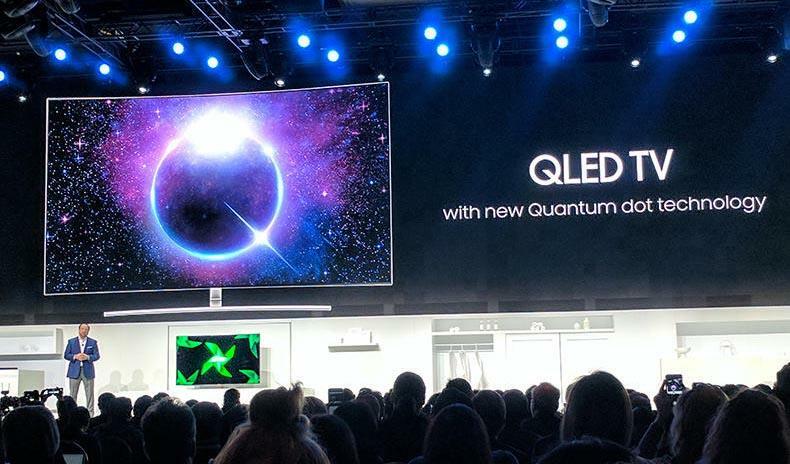 Companies like Samsung, Sony and LG and Sonos presented brilliant new ways to watch our favorite TV shows and movies, listen to music, and so much more. Action camera pioneer GoPro demonstrated that we could soar and shoot videos with a quality and precision not possible before, while Dyson elevated household appliances to a whole new level; here are some of the highlights of what these companies have brought us. QLED TV provides for a billion colors and uses Quantum Dot technology in conjunction with a new Metal Core to enable 100% color volume - translated into visuals where the color doesn’t fade, regardless of how bright the scene are. The panel achieves a brightness level that is very close to natural light and so provides for an accurate visual experience. Add in 4K HDR and the results are greater, more lifelike detail as compared to conventional TV. Plus the Invisible Connection, between the TV and every device plugged into it, is automatically detected, with the included Smart Remote knowing what to do by just being aimed at the TV. Looking like a picture frame hanging on the wall, The Frame doesn’t fade to black when the picture is off — instead it transforms into a work of art: users can select from over 100 custom-designed digital art pieces to display. A sensor keeps the color and brightness intensities of the artwork at a level consistent with the lighting in the room, no matter the time of day. Coupled with the Invisible Connection and a no-gap wall mount plus customizable accessory options including interchangeable bezels and an optional Studio Stand, it is becomes easy to compliment the user’s living space in a way that was not possible before. Of course a sharp, clear picture with brilliant color and contrast is assured through HDR 4K technologies for a high resolution, lifelike picture. 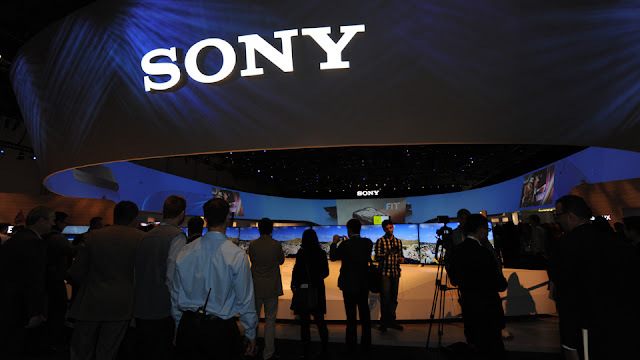 Sony’s flagship brings true reality to the screen utilizing OLED technology (organic light emitting diodes) to create exquisite contrast with perfect black and color — 8 million+ pixels self-illuminating precisely and individually. Color is selectively matched across a wider gamut so that subtle colors appear naturally on screen, as 4K high resolution vies with the brightness, color and detail of High Dynamic Range (HDR); handling a variety of formats including HDR10, Hybrid Log-Gamma and Dolby Vision. A wide viewing angle means no jockeying for the “sweet spot” on the couch. The A1E also possesses unique Acoustic Surface technology, in which the entire screen becomes the speaker — eliminating speakers beneath or to the side of the display, yet filling the room with awe-inspiring sound. Sony’s LCD flagship model comes equipped with Sony’s Backlight Master Drive technology — this technology provides for near perfect black levels that other TVs can’t match; with each LED controlled individually for a precise picture wherein each LED emits a straight beam for a greater brightness and more accurate contrast. Featuring 4K high resolution and the 4K Processor X1 Extreme for more real-time image processing), the Triluminos display increases the color depth to demonstrate brighter and more realistic colors. The X-tended Dynamic Range Pro is used to increase the quality of HDR, with support for HDR10, HLG and Dolby Vision. 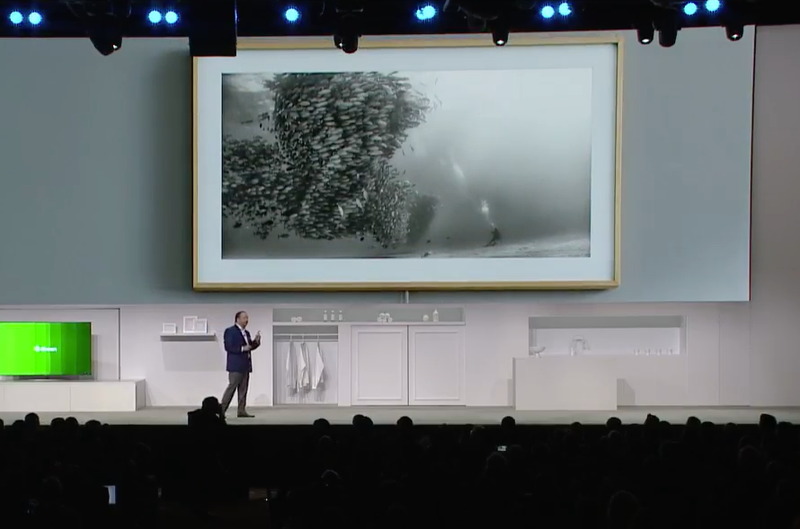 In addition to built-in 3D capabilities, there is Android TV voice search and Google Cast for sending movies and music from a smartphone to the TV. 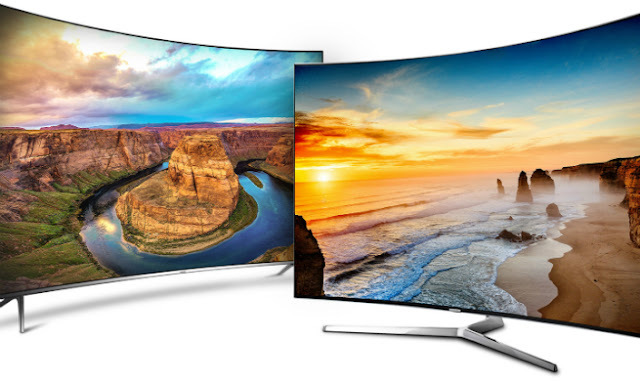 The LG E7 Series employs OLED technology. The panel uses organic light-emitting diodes which generate their own light, unlike the added lighting required with a LCD panel (resulting in a thinner and less weighty TV). As a result, a perfect back can be achieved, one with greater shadow detail. Additionally there is an expanded color palette with over a billion colors. Add in 4K resolution and high dynamic range (HDR) and the results are a more lifelike and realistic looking image. Aiding in enhancing the image are such technologies as HDR10, HLG and Dolby Vision, along with Dolby Atmos for a more precise surround sound. The LG W7 OLED is the flagship model and is also known as the W7 “wallpaper” due to its width being an astonishing 2.5mms thin. This is due to the electronics having been moved into a separate box that also serves as a Dolby Atmos soundbar. Super UHD provides for deeper and more naturally color through the use of Nano Cell Display technology; able to display a billion lifelike colors for more subtle and precise gradation (64 times richer than a conventional TV). Additionally, colors look consistently truer, with black level looking deeper, regardless of whether one is looking straight at the display or at an angle, thanks to IPS technology ensuring a wide viewing angle. Also, Active HDR with Dolby Vision adds to the already high detail resulting from 4K resolution. This is all contained in a space saving design. Not content with merely making a smart speaker with surprisingly rich, room filling sound, Sonos built in Amazon Alexa for hands-free music control. But more than just playing songs, you can check news and traffic and even manage other smart devices in the home. Add the Sonos app and all your music can be managed in one place: Amazon Music, Spotify, Apple Music, Internet radio and hundred of other streaming services can now be accessed. 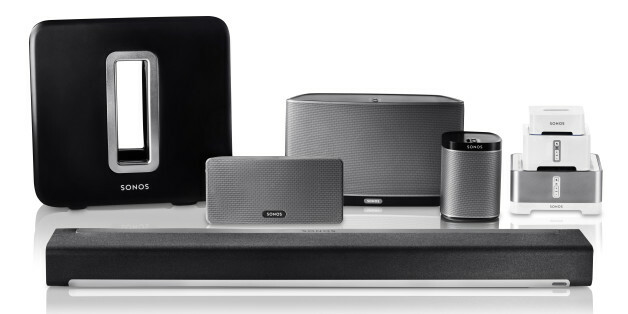 What do those in the know think of the Sonos One? “The Best Voice-Activated Speaker Ever Made” —Inc. 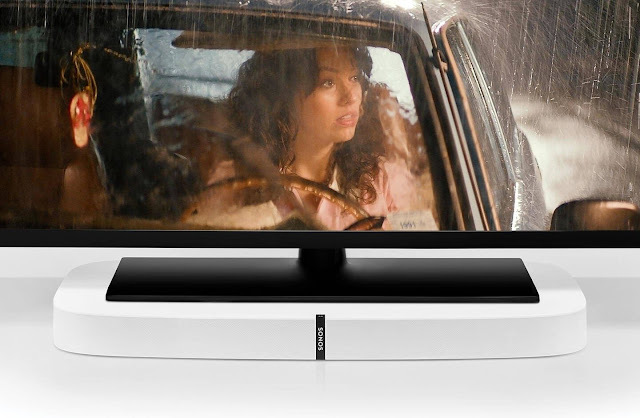 Make TV sound even better while not standing out — that’s why Playbase doesn’t go on the wall but instead goes under the TV. It’s low profile practically disappears when placed beneath any TV up to 77 lbs. Then do the simple 2-cord setup and be prepared for 2.1 Full-theater sound that makes everything sound better. Or listen to music that never stops — because the streaming comes over Wi-Fi, not Bluetooth. 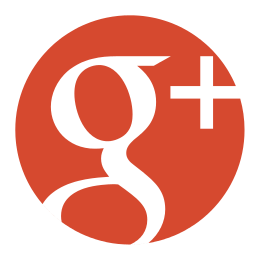 What do Playbase customers say? This action camera features 4K 60 fps shooting, plus amazing slow motion capture @ 1080/24p and a digital zoom capability. Employing a new chip platform for greater image quality and advanced “intelligence,” a 3-axis digital video stabilization system ensures sharp video with greater dynamic range, richer colors and better low-light image capturing. 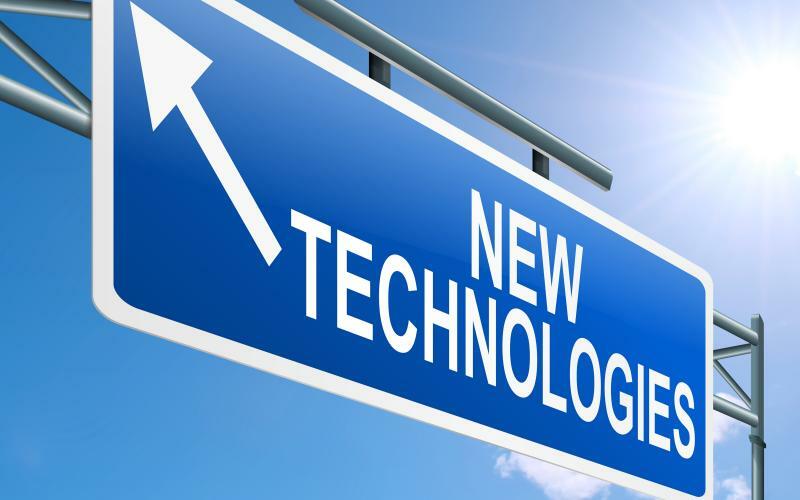 Next generation video compression (HEVC standard) allows for high resolution, higher frame rates and mobile device friendliness; being able to send video and photos straight to a smartphone. The Karma drone folds up into a case and can be worn as a backpack so it can be taken anywhere. But in the air is where it wants to go, so use the buttons on the game-like controller to have it takeoff, land or return to home. Setup also includes a flight simulator for teaching first-timers the basics of flying a drone. With the stabilizer in place, a smooth ride is assured. But should you be using one of the GoPro compatible cameras (Hero5 Back, Hero5 Session, Hero4) and want it to be earthbound, the stabilizer detaches for hand-held and body-mounted use. It self-rights itself when toppled — other vacuums fall and stay down. 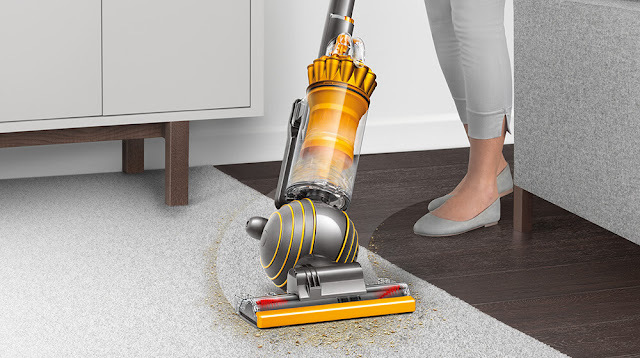 But with the core technologies housed in the ball (and the 2-tier radial cyclone increasing the airflow) you can concentrate on picking up fine dust and ground in dirt since this vacuum can turn on the spot and follow you effortlessly around. There’s even a hygienic dirt ejector to push out trapped dirt and debris as you empty; your hand stay clean. Similar to the Big Ball but smaller, a retractable handle makes storage 50% easier than a full-size upright. 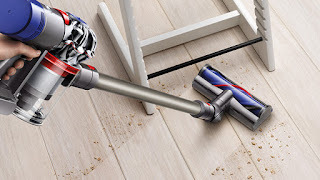 There’s an advanced self-adjusting cleaner head and the cord wand and hose extends to 43” for cleaning up high and under furniture. With radial root cyclone technology to increase suction power and trap more dirt and dust, Dyson’s lower priced full sized upright includes a motorized brush bar that is ideal for removing pet hair. Turn it off and it’s ready for delicate rugs and hard floors. 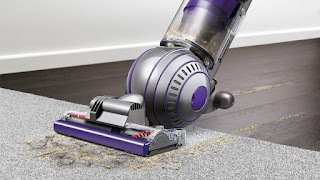 The cleaner head also self-adjust from carpet to hard floors. This upright features the new Cyclonic technology called Dyson Cinetic Science which eliminates the need for a filter. Its motorized brush bar handles pet hair with ease and can be turned off for use on delicate surfaces. Greater suction is derived from the self-adjusting cleaner head, while the ball design makes for easy maneuvering around furniture and obstacles. 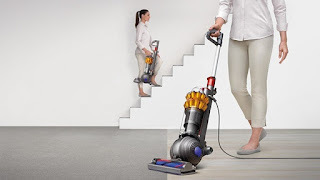 This upright vacuum utilizes an air-driven tangle free mini turbine tool for cleaning upholster, cars and stairs of dust, dirt and pet hair. Its ergonomic handle is also designed and positioned for comfortable carrying. 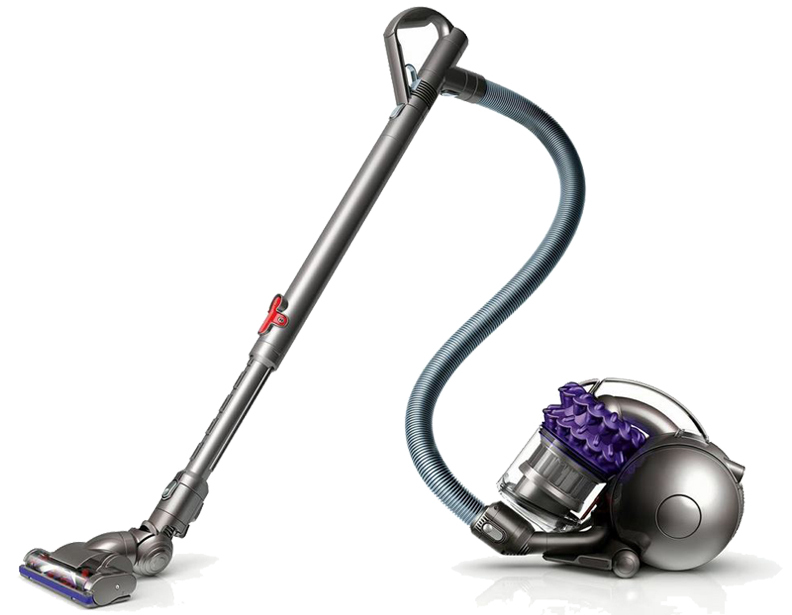 Features include Dyson Cinetic Science to capture the dust that clogs other vacuum’s filters, a self-adjusting cleaner head and no dirty filters to wash or replace. 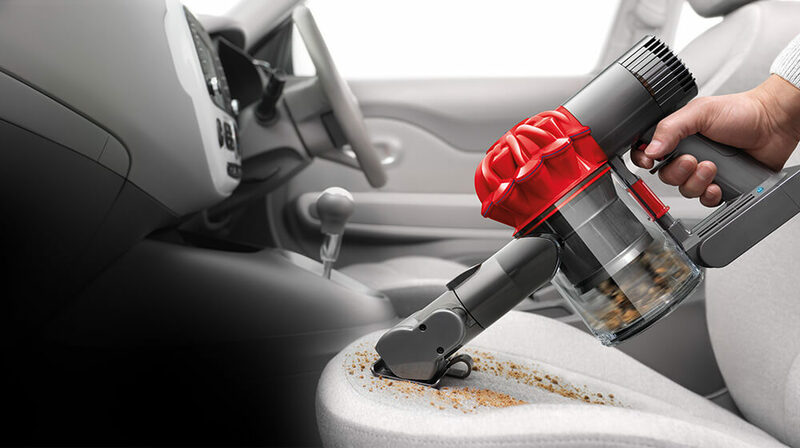 Besides a smooth action (telescoping) wand and hose release for cleaning up high and under furniture, there’s also push button release for emptying the hygienic bin of dust and debre. 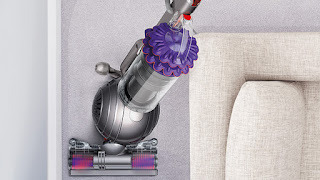 Dyson’s most powerful full size animal upright vacuum use the latest radial root cyclone technology to increase suction power and trap more dirt and dust. 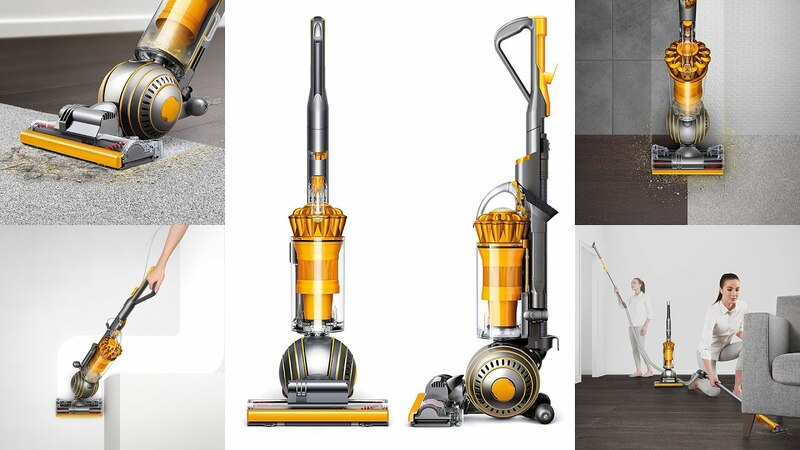 There is a HEPA filtration, a motorized brush bar and an included air-driven tangle free mini turbine tool for cleaning upholstery, cars and stair. There is also a quick draw telescope reach wand and an ergonomic handle. 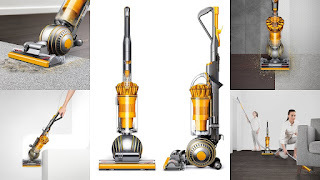 This vacuum is designed for cleaning across all floor types and uses a whole-machine HEPA filtration system for trapping allergens and bacteria inside. Ball technology makes steering into difficult places easy, and there’s no bending down due to the turbine head being controlled at the handle. A single button press releases the dirt from the hygienic bin. 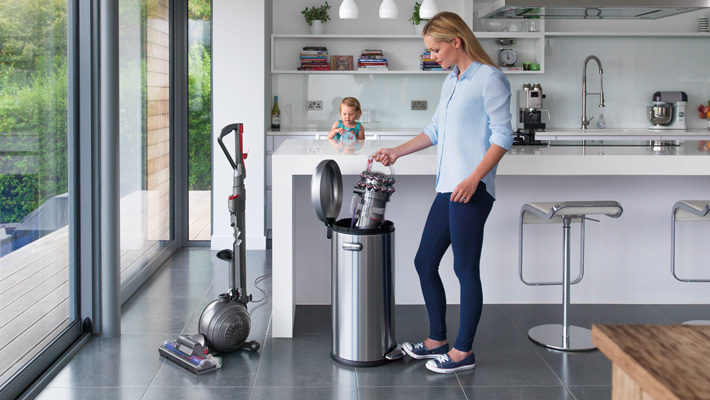 It’s hassle-free because it’s cord free, with up to 30 minutes of fade-free suction. 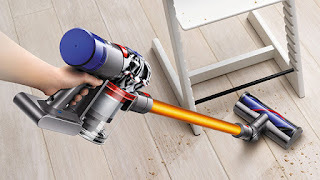 Powered by a Dyson digital motor and including a hygienic dirt ejector, also included is a mini motorized tool, extension hose and combination tool. Up to 30 minutes of strong suction, courtesy of fade-free lithium batterie powering a Dyson digital motor. Tools include a mini motorized tool, combination tool and crevice tool. Dyson’s latest cordless stick vacuum employs a stronger motor than previous models and has 15% greater suction — yet it’s 50% quieter. A HEPA filtration system captures allergens and expels cleaner air than the air you breathe. A larger dust bin holding more is enhanced by a bigger battery that extends use to up to 40 minutes. With similar features as that of the Absolute, this vacuum is engineered for homes with pets. It captures allergens and has a selector switch that provides up to 7 minutes of higher suction for more difficult tasks. The Dyson Hair Dryer measure air temperature 20 times per second to keep the heat consistent and produces airflow traveling at 105 mph! Powered by Dyson’s fastest digital motor, the weight and shape is radically redesigned for a comfort and balance when held. 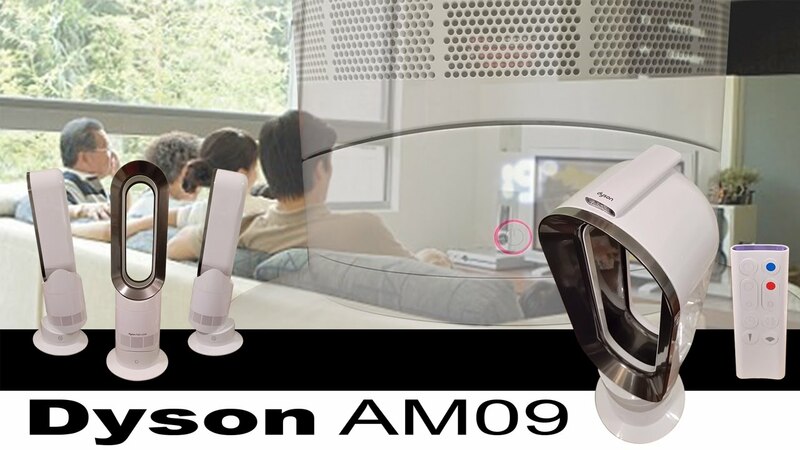 The Dyson AM09 Fan Heater provides precise, energy efficient heating, thank to an intelligent thermostat which monitor the room as well a main ting the selected temperature. There are no exposed heating elements and automatically cuts off if tipped over. It features air multiplier technology which is a blade less design, eschewing any danger in operation. Besides heat, there is also a “cool” setting to function as a fan. 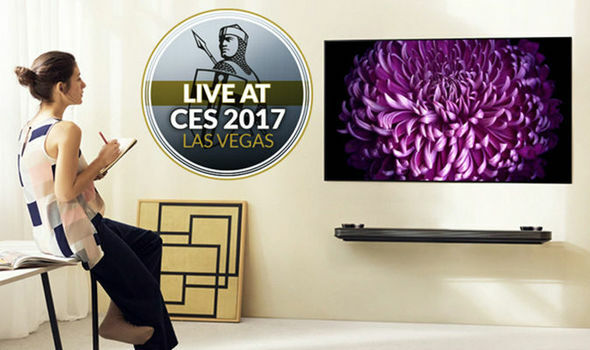 That's only a partial recap of some of the exciting new entertainment and home technologies released during 2017—and 2018 promises even more amazing advancements. To see all of these amazing products in person, stop into any Video & Audio Center superstore showroom and ask them to see "What's new"!